TRUMP TOWER — Demonstrators swarmed the streets of Midtown from Columbus Circle to Trump Tower Wednesday night to show their support for immigrants across the country. 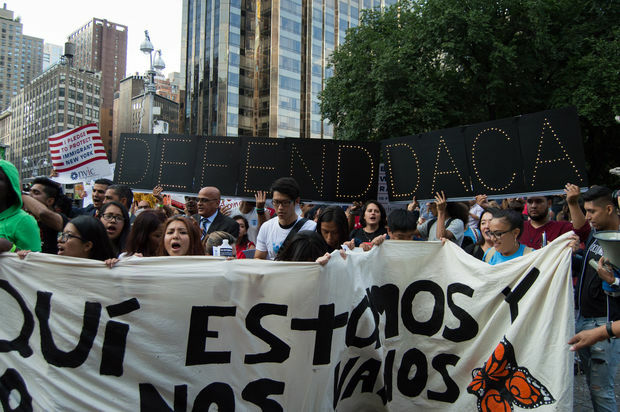 Nearly 50 organizations organized the rally in anticipation of an announcement from President Donald Trump that he will make good on his campaign promise to end the Deferred Action for Childhood Arrivals program. Better known as DACA, the Obama-era program allows children who emigrated to the United States to stay and work in the country for two-year spans that are subject to renewal. Many of those who benefit from the program — known as "Dreamers" — have been anxious for their futures. The crowd congregated at Columbus Circle before marching along 59th Street with colorful signs, chants in English and Spanish, and an LED-lit “DEFEND DACA” banner. A handful of anti-DACA counter-protesters present at Columbus Circle were quickly overwhelmed by the main group. The march continued to the corner of Trump Tower at 57th Street and Fifth Avenue before heading west to Broadway and reconvening at Columbus Circle. Organizers said their initial headcounts were roughly 3,000 attendees. Angie Kim, a DACA recipient and community organizer at the Korean advocacy nonprofit MinKwon Center, said she arrived in America at 9 years old and has lived in the United States undocumented for 25 years. “Every day I’m trying to figure out with my family what we’re going to do if I lose my job… and what we’re going to do to protect me from being deported” Kim said. She added that if Trump chooses to rescind DACA, she wants to see the president push for legislation that would provide a pathway for those like herself. Ismary Calderon, a student at John Jay College of Criminal Justice, said she was able to work and get a full scholarship through the DACA program. Originally from Mexico, Calderon now lives on Staten Island and studies Spanish at John Jay.